Last weekend my wife and I took a day trip over to Shreveport. Our trip had two purposes: 1) shopping for some items we couldn’t find in Monroe, and 2) visiting Craig Pratt, a colleague and friend from the Shreveport Symphony. Craig has played with the SSO for a number of years, and is an active freelancer throughout the area. He also has an amazing collection of horns, mouthpieces, and other related equipment. Craig is generously letting me borrow his Paxman model 40M descant horn for some upcoming performances, which I picked up during our visit. More on the horn later, but first here are some pictures (posted with permission) of a few of the items in Craig’s collection. 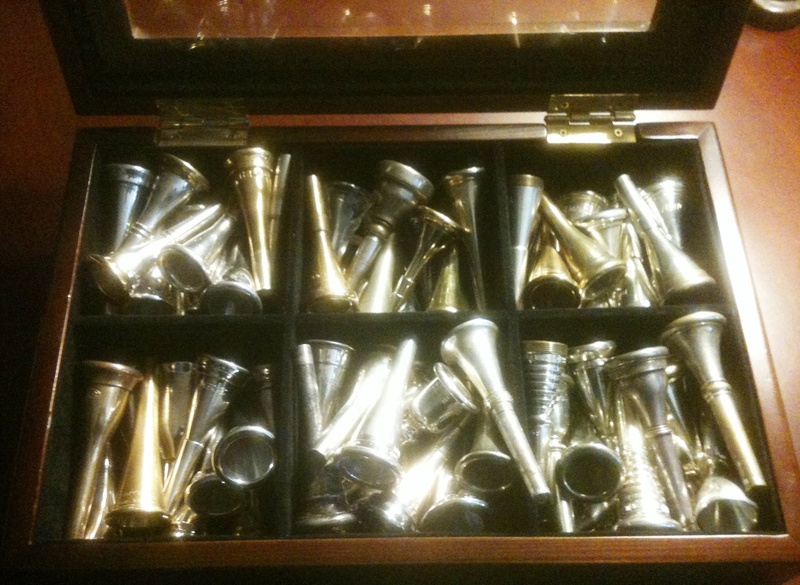 And I thought I had lots of mouthpieces! There are a number of vintage and otherwise rare pieces in this collection. Craig also owns a natural horn built by Carl Geyer, a Trompe de chasse, and another natural horn built by Lowell Greer. Oh, and he also has a few mutes. Of particular interest in his arsenal are an original Rittich mute, as well as a cup mute (top image, far left) and a Harmon mute (top image, fourth from left). I wasn’t aware that a Harmon mute for horn had ever been manufactured, although Allan Mathieu Perkins has discovered that a bass trombone Harmon mute fits very well in a horn bell. As for the descant horn, it is a great little instrument, and I am enjoying playing it. I had already planned to use my Holton H200 descant for some upcoming performances, but jumped at the chance to try out one of Paxman’s earlier Model 40’s, which in the opinion of many players are among the best descants around. Looking at the two horns side by side, it’s clear that they are based on a similar design – the Holton is on the left and the Paxman is on the right. After playing on it for a few days, here are the differences I’ve noticed. The horn is a bit lighter, and more resonant throughout the range. The B-flat side is much easier to tune than on the Holton, and in general locks into the center of each note more quickly. The high F side is more responsive than the Holton, and has a less brittle quality to the sound. The grip is less comfortable than my Holton, which has an Alexander flipper installed, but I have ordered a velcro hand strap to see if that will help. This is not to say that the Holton is a poor instrument, and for the price it would be hard to find a better entry-level descant. However, the Paxman was probably built to much closer tolerances, and plays like it. Hopefully I’ll be able to pick up a similar model on the used market in the future. In the meantime, my gratitude goes to Craig Pratt for the generous loan! Have you played a the Yamaha descant? How does in compare with the Holton? I would imagine it would have better response, too, because it’s a smaller instrument. And wow! So many mutes! I’ve never played on a Yamaha descant, but have heard very good things about them. Richard Chenoweth at the University of Dayton is a big fan, I believe. Yes…that’s a lot of mutes! Thank you for the reference, I’m glad that someone is able to make use of what I’ve written. The are several companies that make Harmon style mutes which are all slightly different sizes. It’s best to try a few to see which fits best. A Denis Wick bass trombone “wah-wah” mute fits my Holton H279 perfectly. I’d imagine that horns with small bells, like the descant horns you mention, would be better suited by a tenor trombone Harmon mute. Thanks for your web site. Can you steer me to a source for older horn recordings. I studied at Julliard about 60 years ago and would like to find recordings that may still be in archive from that era. Thanks again, Jim Larkin. Silly question: What makes a Rittich mute a Rittich mute? Is it just the fully conical shape (compared with cone + cylinder of other mutes)? Silly question: What makes a Rittich mute a Rittich mute? Is it just the fully conical shape (compared with cone + cylinder of other mutes)? Or is it something else? Not a silly question at all. Yes, the term Rittich mute refers to a cone-shaped style of mute invented by Eugene Rittich, http://www.hornsociety.org/ihs-people/punto-recipients/46-people/punto-recipients/343-rittich. I recently convinced my University to purchase a used Paxman 40M – it should arrive within the next week or so. I’m really looking forward to having it on hand for me and my students to use! That’s awesome! The older Paxmans are very fine horns. I’ve not played one of the newer model descant horns, so I don’t really know how they compare. Hope all is well!